In GTA V using Reshade Overlay Settings I need to go to the DX11 tab and select the 5th depth buffer to make MXAO work. How can I save that buffer selection setting? Would love to know the answer too. Similar situation with Steep. 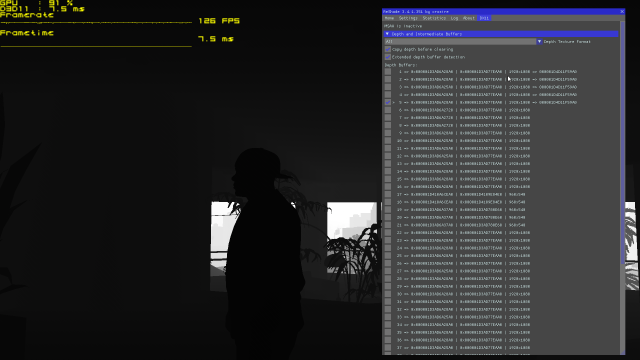 In GTA V (and other games), the depth buffer selection is based on the depth texture address. This address changes at every game restart, so you cannot save it in the config files. However, there is another way of retrieving the depth buffer, before this one is cleared. In GTA V, it is possible to use it by ticking the "Copy depth before clearing" checkbox. When this mode is enabled, you can also see additional depth buffers by ticking the "Extended depth buffer detection" checkbox. When you select a depth buffer using the "Copy depth before clearing" option, the parameter is saved and can be retrieved at the next launch. Last Edit: 7 months 3 weeks ago by thalixte. The "Copy depth before clearing" and "Extended depth buffer detection" give me other addresses not working in GTA V. But without the checkboxes it is always the first entry in the list. So even if the address changes at every game restart I wish I could save the setting "Choose the first entry in the list"
In the preprocessor options, i set RESHADE_DEPTH_INPUT_IS_REVERSED to 1. Last Edit: 7 months 7 hours ago by thalixte. I tried that but the "copy and extended" 5th buffer selection I get flicker every second. Without "copy and extended" the first buffer always works without flicker. I wish I could save that setting - choose the first buffer in the list automatically. Strange. it does not flicker in my rig. Maybe a pb with the sync method (vsync or not). I own a gsync mmonitor. Also, do you play online ? It is GTA V online with gsync monitor and nvidia gtx 1080ti driver 391.35 set to vsync on. The depth buffer detection only works in offline mode.